While Libby Schaaf was giving her first press conference post re-election at the St. Vincent De Paul homeless shelter, her administration was delivering an eviction notice to two Deep East Oakland encampments, including The Housing and Dignity Village. Located at S Elmhurst Ave and Edes Ave in Deep East Oakland, The Housing and Dignity Village (HDV) is an intentional community for unsheltered women, their families, and support networks, and doubles as a community resource center serving the area’s unhoused and housed Black and Brown residents. At least seven residents of HDV will resist this eviction, risking arrest, and are calling for advocates and press to join them on Saturday, November 10, beginning at 7:30 AM, for copwatch, support, and to witness unsheltered peoples asserting their right to safe shelter on public land. County Supervisor Nate Miley and his staff visited HDV the day before the eviction notices were posted and expressed support, appreciation, and the desire to upgrade – not evict – the encampment. HDV is a clean and sober curbside community led by women of color, both housed and unhoused. Its creation was in protest of the sexual violence unsheltered women endure, and the City of Oakland’s ongoing gross neglect of Black & Brown communities. It provides meals, medical services, free winter clothing, and a community garden for everyone in the neighborhood. The HDV is supported by Brookfield residents, The East Oakland Collective, The Village, The Ron Dellums Institute for Social Justice, Omni Commons, and other organizations and advocates for the human rights of curbside communities. Schaaf’s threat of eviction comes less than a month after the United Nations Special Rapporteur on Adequate Housing, Leilani Farhai, released a report on global unsanctioned settlements like the Housing and Dignity Village. Policies “denying access to water, sanitation and other basic necessities, constitute cruel and inhuman treatment and violate the rights to housing, health, water and sanitation and the right to life,” Farhai wrote. HDV echoes Farhai’s report in stating that housing is a human right, and housing should be available to all. The Village began as a grassroots movement in December of 2016, creating autonomous encampments on public and private land in Oakland. Providing those who have been displaced by gentrification with basic needs and rights: housing, food, provisions, healing, and dignity. Using a diversity of tactics to reach our goals is necessary in the current political, economic and historic moment we are in: direct action and policy reform. Adverse possession and purchasing lands; reparations and self-determination; serve the unsheltered and self-governance of the unsheltered. Learn more at https://thevillageinoakland.org. The East Oakland Collective (EOC) is a member-based community organizing group invested in serving the communities of deep East Oakland by working towards racial and economic equity. With programming in economic development, civic engagement and leadership, and homeless services and solutions, we help amplify underserved communities from the ground up. We are committed to driving impact in the landscape, politics and economic climate of deep East Oakland. ​Learn more at http://www.eastoaklandcollective.com. 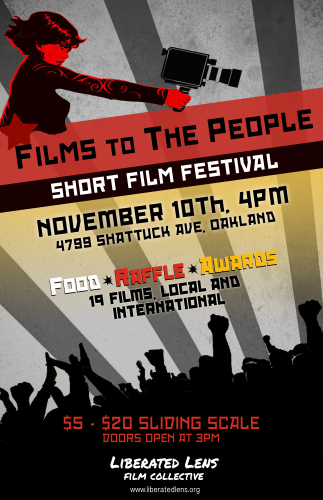 Films 2 The People is a film festival highlighting short films of 20 minutes or less with social justice themes. We like to showcase filmmakers of various ages, genders, and ethnic backgrounds, and subject matter that is pertinent to our times. While we prefer to work with local filmmakers, submissions are opened to everyone. Films are selected for quality and diversity of perspectives. You’re invited to a limited theatrical screening of Say Her Name: The Life & Death of Sandra Bland. On July 10, 2015, Sandra Bland, a politically active 28-year-old African-American woman, was arrested for a traffic violation in a small Texas town. Three days later, Sandra was found hanging from a noose in a jail cell in Waller County, Texas. Described by The Hollywood Reporter as “heartbreaking..one of the most galvanizing episodes of this generation’s civil rights struggle…poignantly explored”, Say Her Name follows her family and their legal team as they try to make sense of what happened, presenting a compelling look at her life as well as her death. It’s both a vigorous, engrossing mystery and a disturbing account of systemic racism and neglect. Following the documentary, there will be a moderated discussion with Sharon Cooper (film subject & sister of Sandra Bland). East Bay DSA’s general meetings (GMs) are held on the second Sunday of each month. These meetings are the highest governing body of our organization and include deliberation and voting on member-submitted resolutions, member announcements, reports from our committees, and more. Volunteering at the GM is lively, easy, and low-commitment, and hugely benefits the meetings and thus our internal democracy. If you intend to come and would like to volunteer (! ), let us know. Use this form, too, if you have child supervision or accessibility needs, including the need for an ASL interpreter. With our new regular schedule, member-submitted resolutions will be accepted on a rolling basis. Please email them to resolutions@eastbaydsa.org. The submissions deadline for each meeting is two days after the previous one. General meetings are run by the Meetings Committee. For questions or comments, or if you are interested in joining the committee, write us at meetings@eastbaydsa.org! East Bay Peace Action invites you to their annual gathering featuring Eric See presenting a post-election analysis. This event takes place Sunday, November 11th at 2:00pm at the Fred Weaver Residence Center, St. Paul’s Tower, at 100 Bay Place in Oakland. The next Green Sunday forum will come less than a week after election day in what has proven to be one of the most contentious and emotional electoral cycles (and related political turmoil) in recent memory. Come participate in an evaluation of not only the results, but of the implications for our ongoing fight for independent politics and for a range of policies and struggles which might follow in their wake. This discussion will examine our local electoral efforts, as well as what occurred on a regional, state and national level, “Blue Wave” or not. Please invite friends whether Greens or not, including those who may have voted for the corporate parties. We can anticipate a lively discussion. Ashby BART is approximately 7 blocks away. SPONSOR: Green Sundays are a series of free programs & discussions sponsored by the Green Party of Alameda County. They are usually held on the 2nd Sunday of each month. The monthly business meeting of the County Council of the Green Party of Alameda County follows at 6:45 pm. Council meetings are always open to anyone who is interested. The Alameda County Sheriff’s Office applied for and received a grant targeting incarcerated Black Muslims in Alameda County, according to the East Bay Express. The Homeland Security CVE, or Countering Violent Extremism program, has been criticized for solely targeting Muslims as susceptible to violence and extremism, while not addressing the rising threat of white supremacists. The “#StopCVE: Race, Islamophobia, Policing and Mass Incarceration in Alameda County” panel will discuss the CVE grant program, how the “E Pluribus Unum” project in Alameda County came to be, history of surveillance of Muslims, and community efforts to increase transparency in the sheriff’s operation of the county’s jails and other social service facilities. Panelists include: Imam Abu Qadir Al Amin, imam, SF Muslim Community Center; Sally Horna, legal fellow with Council of American Islamic Relations (CAIR) Bay Area; Fatima Ladha, community advocate, Advancing Justice – Asian Law Caucus National Security and Civil Rights Program, and Jose Bernal, senior organizer, Ella Baker Center for Human Rights. Journalist Rasheed Shabazz will facilitate the conversation. SAVE THE DATE: we need court support on Tuesday, 11/13, when a federal judge will hear our case against the eviction regime of Mayor Libby Schaaf and her Homelessness Czar Joe DeVries. This will be at 2 PM, at the Oakland Federal Courthouse, 1301 Clay St, Oakland CA 94612. 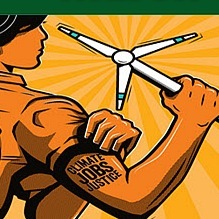 Building on the strong labor contingent in the September 8 march for climate, jobs, and justice, Bay Area labor activists and allies are continuing to meet to talk about next steps. The next meeting will discuss whether to establish a Bay Area chapter of Labor Network for Sustainability and how to best go forward to shape labor’s response to climate change. Food will be provided. Pot luck contributions are welcome but not required. PLEASE RSVP to make sure there’s enough food for everyone. Please join us at Berkeley’s International Computer Science Institute (ICSI), where Serge Egelman will share his research on how game apps have been collecting kids data. Serge’s work has been covered by the New York Times and Washington Post. Serge’s team examined more than 5000 of the most popular kids apps and more than 50% appear to be failing to protect kids privacy. Serge Egelman is the Research Director of Usable Security and Privacy at ICSI and is a returning Privacy Lab speaker. ICSI will host us at 1947 Center Street in Berkeley (6th floor). Doors will open by 6pm for networking and Serge’s presentation will start at 6:30pm. If you arrive after 6pm, someone will be there to help with after hours admissions (the front doors and elevators require key cards after 6pm). 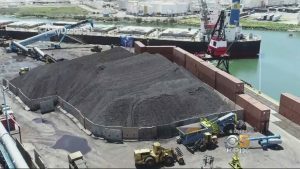 Join Richmond community activists to discuss initiatives to stop the export of coal from Richmond’s Levin Terminal. Get updated on the various connected efforts to make Richmond coal-free: implementing air monitoring under AB 617, maintaining momentum with the Richmond City Council, and developing a bulletproof anti-coal ordinance. Learn how you can help monitor the coal trains that are leaking their toxic load throughout Richmond’s residential neighborhoods, and find out how activists in Oakland, Richmond and Vallejo are coming together to just say no to coal. Insurance companies are supposed to protect us from catastrophic risks. Yet when it comes to climate change, the largest threat to humanity, U.S. insurance companies are doing the exact opposite. 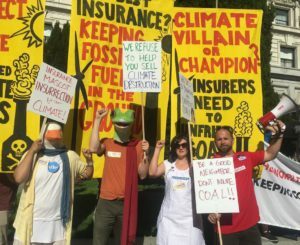 With their massive investments in fossil fuel companies and insuring of drilling and mining projects, the U.S. insurance industry is making a terrible problem worse. This has to stop. Hundreds of lobbyists for the U.S. insurance industry are coming to downtown San Francisco for a convention. Join us at lunch time to send them a message: Insure Our Future—Stop Insuring Climate Change! Meet us at the corner of Taylor and O’Farrell at 11:45 AM. We’ll have colorful costumes (Aflac duck, anyone? ), signage, and some great guest speakers. This will be an enjoyable, non-arrestable action.